As evidenced by previous E-Sylum postings, there's been some renewed interest in this as yet maverick issue; this, given that there are some gold coins which bear the EVERMAN counterstamp. Some months ago, I reported finding the latest dated host coin bearing this mark, an 1857-O half dollar. 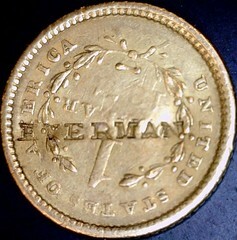 As luck would have it, I just acquired an 1851 gold dollar that bears the EVERMAN mark. I believe that this brings the reported count to twelve or so pieces. The discovery of the 1857 dated host coin suggests to me that Everman's counterstamp may have been applied as late as 1858 or thereabouts. This latest find, dated 1851, doesn't offer any additional clues about the issuer. It's been suggested that one Lewis Everman, a Tennessee silversmith may be the issuer. As I reside in Tennessee, I'd love that to be the case! Try as I have, I've been unable to locate a single Everman-stamped product, like a spoon or a watch. This EVERMAN stamp is a retailer's tiny mark; this, as opposed to a silversmith's hallmark set in relief. By the 1850's, many silversmiths found that retailing imported products was time more profitably spent than laboring at their bench. This was especially true in the larger cities like Philadelphia, Boston and New York - then, the three principal cities of counterstamp issue. Below is a link to Boyd's 1859 Lancaster (Philadelphia) Directory. Listed therein, Charles Everman is not listed in McElroy's Philadelphia directories. He remains my odds-on, principal candidate as issuer of the Everman pieces. The Philadelphia area was THE major hub of counterstamping coins. Charles was a retail jeweler, active in 1858. Philadelphia, being a port city, likely saw coins, like the Humbert $50 gold piece, arriving from California. Prominent Philadelphia collectors of that time would doubtless have paid a premium for that "slug." I've long considered the collecting of counterstamps to be the "final frontier" of numismatics. There remains ever so much to be discovered and learned about this genre. Counterstamps that have been positively attributed tell us ever so much about the people who marked them; and, the times during which the coins circulated. Personal stories and history lessons typically unfold as anyone who researches this genre can attest. One last word on the EVERMAN counterstamps .... I'm rooting for Eric Schena, hoping he'll someday prove that Tennessee's Lewis Everman was indeed the issuer! What a fantastic piece! I am still on the prowl for some piece of evidence (an ad, a marked example of silverware, etc.). 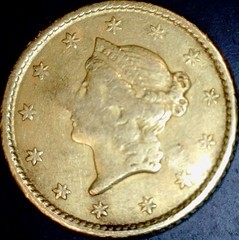 I have an 1854 quarter eagle and an 1858-O half dollar with that mark. I hope something turns up to solve it once and for all.